From 2006 through 2016, the number of insured depository institutions in the United States has fallen from 8,691 charters to 5,922, a decline of 2,769 charters or a 32% loss. This headline loss number is worth talking about, but is neither news nor new. The loss of charters is a frequent source of discussions around bank board rooms, stories from trade press, and chatter at banking conferences. The number of insured charters has also been in steady decline, with at least 33 years of declining numbers. However, a deeper dive into the numbers reveals some unexpected trends below the headline 32% loss of charters. Note: We’ve also recorded an accompanying podcast for The Bank Account on the Truth About Industry Consolidation. The podcast contains additional analysis to the numbers presented here, and is a useful addition, but not a substitute, to this content. In addition to listening to this episode, we encourage you to click to subscribe to the feed on iTunes, Android, Email or MyCast. It is also now available in the iTunes and Google Play searchable podcast directories. As of December 31, 2016, we had 5,922 institutions with $16.9 trillion in total assets. 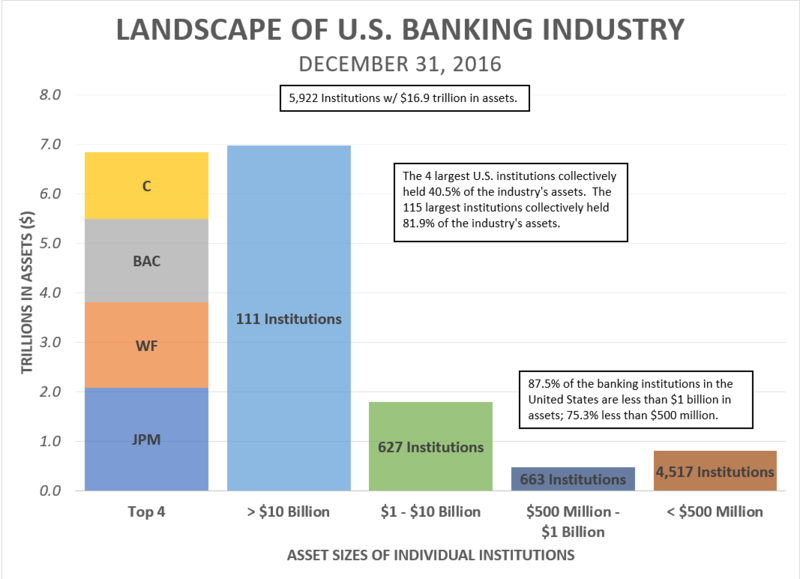 The four largest depository institutions by asset size (JPMorgan, Wells Fargo, Bank of America and Citi) hold $6.84 trillion in assets, or 40.5% of the industry’s assets. There are 111 additional banks that have assets greater than $10 billion, holding $6.98 trillion. That’s 1.9% of the total charters, holding 81.9% of the aggregate assets. On September 28, 2015, the FDIC published the 2015 summary of deposits information. Using this data, we compared the deposit data for Georgia, comparing 2015 to 2005. Without even looking at the numbers, we knew the period would represent significant change, as the Great Recession had a significant impact on the banking industry, particularly in Georgia. As a headline number, the total number of banks with branches in Georgia fell from 367 to 248, a decline of over 32%. However, as with many reports showing the number of bank charters, this number overstates the effect of consolidation as it also reflects internal holding company reorganizations in which multi-bank holding companies have consolidated into one bank charter. These internal consolidations reduced the number of bank charters in Georgia by 51, as the number of multi-bank holding companies fell from 18 to 6 (one of which combined their subsidiary bank charters after the reporting deadline for the 2015 summary of deposits). Notwithstanding the overstatement by the headline number, consolidation is certainly occurring in Georgia. The number of independent banking organizations in Georgia fell from 303 to 235, a decline of approximately 22%. For Georgia, the total amount of deposits assigned to branches rose from $149 billion to $213 billion, a 42% increase, while the total number of branches fell from 2,642 to 2,482, a 6% decline. These combined to increase the average amount of deposits per branch in Georgia from $57 million to $86 million, a 52% increase. Between increasing total deposits and industry consolidation, Georgia saw an increase in the number of larger institutions in the state. The number of institutions with more than $2 billion in deposits increased from 7 institutions to 14, while the number of institutions with between $500 million and $2 billion stayed steady at 19. The number of institutions with between $250 million and $500 million in deposits fell from 40 to 35, a 12% decline, and the number of institutions with between $100 million and $250 million in deposits fell from 103 to 85, a 17% decline. The number of institutions with less than $100 million in deposits was the hardest hit, falling from 131 such institutions to 76, a 42% decline. Consistent with these trends by asset size, but potentially inconsistent with a broader message of unending industry consolidation, the number of banks in Georgia with more than 1% of the total deposits increased from 8 to 14 banks (and the number of Georgia-based institutions with more than 1% of total deposits increased from 4 to 7). At the top of the list, we saw remarkable consistency, with Wells Fargo replacing Wachovia, but otherwise the top 6 institutions in Georgia deposits remained largely unchanged in order: 1) SunTrust, 2) Wells Fargo/Wachovia, 3) Bank of America, 4) Synovus, with BB&T and Regions swapping fifth and sixth. The top three deposit gatherers held 51.7% of the total state deposits in 2015, up from 47.3% in 2005, while the top six held 66.3%, up from 61.2%. The next 20 largest depository institutions in 2005, however, experienced significant change. Eight of the 20 continue to operate, and remain in the same category in 2015, but four were sold and eight went into receivership in the intervening 10-year period. Next week, we’ll take a more specific look at the Atlanta metropolitan statistical area, which comprised over 68% of Georgia’s deposits in 2015 (up from 63% in 2005).